Now if I can only figure out how to get a fireplace in here it would be perfect! A clean studio - that's a relative term isn't it? It's a work in progress as my friend Judi says ... At least I can walk around and work! I decided to break it up into areas so I can leave things out. 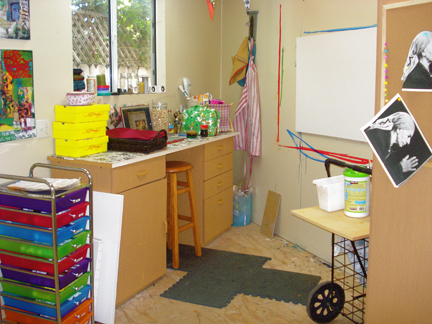 A place to work on jewelry, journaling, a clean table for special projects and I moved the office into the closet. So for now ... until the saga continues ..
p.s. My dear darling Judi (after much haranguing from me ! poor thing) has started a blog - check it out to be sure!!! We get to spend the entire day tmr together. I am taking her here for her bday present! Tote-ally Cool! Tote2 - that is actually the name - I know it is a cheeseball name but I didn't do it! However, the tote is actually great - and it has a magnetic spinning plate on the bottom - so it spins - very cool - I have a mini one for my jewelry tools and a large for my journaling tools - I actually saw these at my friend Carol's studio ,as she uses them - bought the mini from her and got the large one at Target. I realized that I am an OCP - Organized Clutter Person (yes, of course I made this up) and you can't make a leopard change his spots or hers in this case. I am a nester - like lots of stuff but like to know where it is. 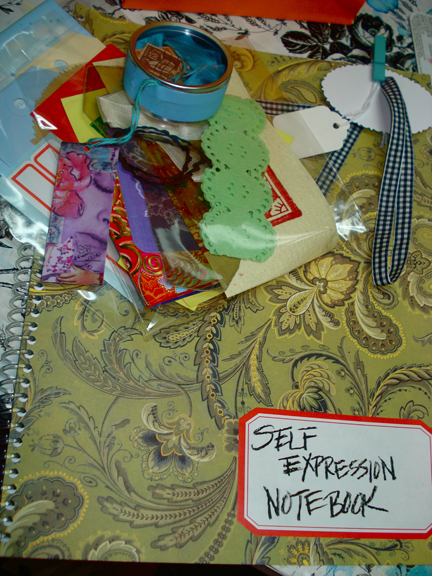 Functionality is the key I have realized and a bit of Acceptance ;) Rebecca Sower had written about the fact that one of her ungoals for the year was to not work so hard on having a neat studio but to make her art instead - it is a struggle for us all do we organize or create. I told her that a while back someone had said to me "your an artist and artists are messy - your studio looks like a studio" and you know what yes that is me I am a NESTER in home, studio, and life - I like to nest - lots of bits and pieces around me. HOWEVER, there is a balance .... having my lovely knee injury has forced me to organize my studio so that it is functional for me - as I can't get up and down a lot. So this weekend I rearranged my desk area so that I could get to things - So here it is - not everything is clean and neat or vintage and wooden or matches in anyway - I have plastic and wood and cardboard and you name it - but it is my little nest and I am comfortable I am still working on the rest of the studio to make it more functional - but another realization for me is that I DON'T HAVE TO DO IT ALL AT ONCE! Yes, another lesson learned is to take it in stages - hard one for me but doable I am feeling like I want to go in there and create and that is the key and BTW this didn't happen overnight - first my loving housekeeper felt so bad about me accident that she and her daughter went in and spent the day just clearing a path into the room ;) Stage 2 was my darling Judi spent the day taking stuff out having me sort and throw stuff away - thank god for these dear souls - then I was actually able to sit and sort and move stuff about. Little steps - little steps - No pun intended ;) and lastly speaking of function I found this great little stand at Bed,Bath and Beyond that is made for pantry shelves - but holds my laptop up and out of the way while I work but can check email, listen to itunes, watch a movie - etc. So I say to you embrace your inner nester, find some balance in your studio - NESTER UNITE! 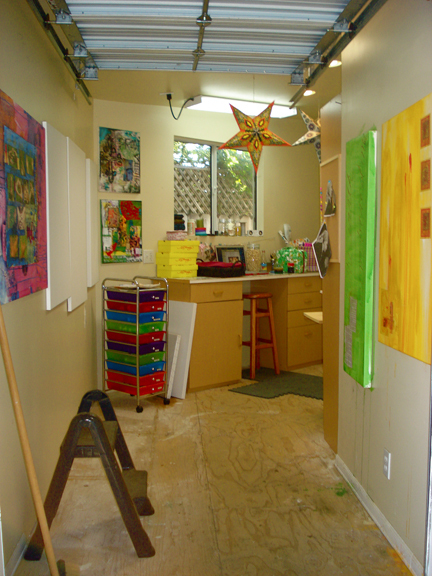 Here is my renovated studio space for painting - I know can you believe it it looks so clean and neat - but don't be deceived - it is just new! It is a shed/storage area in the breezeway of our beach house. I have decided to deem it my painting space and am going - yes I am - going to schedule at least one day a week as my work studio time to come and work on my paintings. 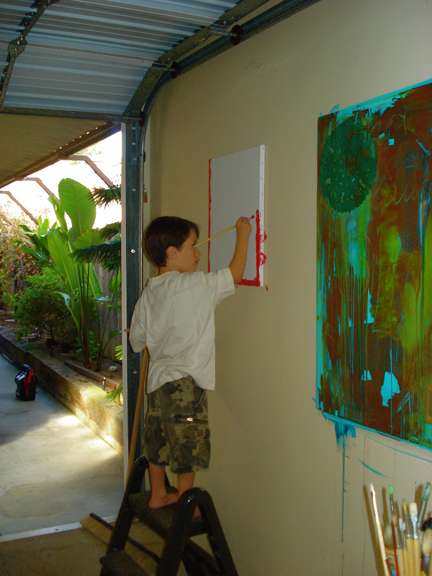 This is my son Payton who - god love him - wanted to paint today - a first - must be the new studio - he is cute though!